It looks like last week’s long-billed curlew was a harbinger of things to come. A quick perusal of the Carolinas Birding List at http://www.birdingonthe.net/mailinglists/CARO.html#1283714291 showed fall migrants popping up all across the Carolinas. I guess as far as real rarities go the Say’s phoebe at Bald Head Island, in Brunswick County just south of Wilmington tops the list. 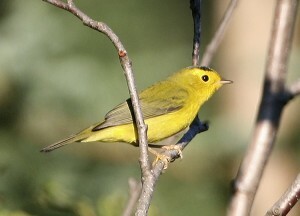 But nearby fall migrant hotspots are producing good birds. Some good finds for Ernie Hollingsworth of Hendersonville at Jackson Park last Sunday included, among others, yellow-bellied flycatcher, blue-winged warbler, Cape May warbler and Wilson’s warbler. Ron Clark of Kings Mountain was also at Jackson Park last Sunday and his sightings included blue-gray gnatcatcher, Swainson’s thrush, magnolia warbler, Cape May and two Baltimore orioles. Simon Thompson of Asheville also reported Cape Mays from his yard. The mass exodus has begun and within the next month somewhere between 9,000 and 12,000 broad-winged hawks will soar over Caesars Head State Park in South Carolina. Wing Nuts, a self-named group of volunteers who count migrating raptors at Caesars Head each year are already there getting cricks in their necks and are always happy to share with visiting birders and/or interested sightseers. Caesar’s Head State Park is located on US 276, in South Carolina just below the North Carolina border. To contact Caesar’s Head to see what’s flying call 864.836.6115. A great place to get a look at migrating passerines (songbirds) is Ridge Junction Overlook near the entrance to Mount Mitchell State Park at milepost 385 on the Blue Ridge Parkway. Ridge Junction is unique because, much like a hawk watch, you can bring a chair and get comfy at the overlook and wait for migrants to come through the pass up and over the Parkway. To get to Jackson Park from Waynesville take Exit 49 B off of I-26 East. Continue on U.S. 64 West towards downtown Hendersonville, go through the traffic light at end of exit ramp onto Four Seasons Boulevard (U.S. 64) for 1.6 miles (passing 4 more traffic lights). After a wetland area on the left, turn left at the 5th traffic light (Harris Street). Go 0.2 mile to STOP sign at end of street. Turn left onto E. 4th Avenue, enter park and follow road to Administration Building (red-brick house on left) and parking. And don’t forget that migrant waterfowl will begin gracing Lake Junaluska any day now. It’ll be mid-October before large numbers begin passing through but wandering herons and/or egrets, terns and gulls could appear now as well as a teal or two.